This post is all about the anatomy of skin, or to be more specific the epidermis and dermis ... Insert excited jazz hands here! Your epidermis acts as your face to the world. It's what you present to the world on a daily basis. If it's clear and blemish free, you most likely would like to keep it that way, and if it's not you most likely would like to get it to that clear state. Exfoliate, exfoliate, exfoliate! It helps to rid your skin of all those dead skin cells which results in brighter, clearer and smoother skin. There are many different options of exfoliation from Aha's, Bha's, Acids, treatments such as peels, microdermabrasion etc ( I will be talking about this in more detail in a future post) but I would avoid the harsh nut type exfoliators, they are usually quite large and rough in texture which can scratch the surface of your skin. As we get older, external factors such as sunlight and internal factors like stress and diet can cause collagen and elastin to breakdown as well as increase moisture loss. What can you do to help your skin? 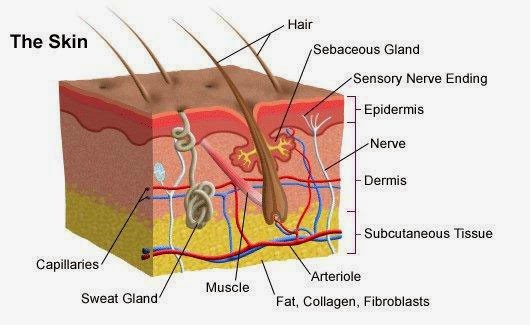 This will hopefully give you a little guidance on how these two layers of your skin work and why it's important to protect and build up your skin to ensure you have the best skin that you can.